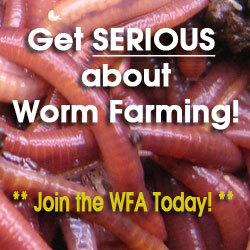 Welcome to the first installment in my “Bootstrap Worm Farming” blog (and audio) series! Right off the bat I recommend signing up for the Modern Worm Farming e-mail list if you want to keep up to date with the series and learn more about Bootstrap Worm Farming in general. At the time of writing this I am in the process of creating a full fledged video course also called Bootstrap Worm Farming. Absolutely zero pressure to invest in that and I am certainly NOT going to be beating you over the head with sales pitches about it – this blog series alone will contain a TON of helpful info related to the topic. So WHAT exactly do I mean by “Bootstrap Worm Farming”, and WHY should you care? The term bootstrapping (as it relates to business) refers to the idea of starting a business venture solely with your own capital – and then reinvesting what you earn to continue building that business. We’re not talking about getting big loans, rounding up angel investors, or any sort of venture capitalist involvement. It’s about pulling ourselves up by the bootstraps and getting things off the ground on our own. Yes this sounds a little cheesy and there is a bit of a silly pun in there – but there is also some VERY valuable wisdom! Many people discover the magic of vermiculture/vermicomposting – they see how fast a population of worms can grow, how incredible worm castings are for boosting plant growth – or perhaps they fall under the spell of someone trying to market some form of “turn-key” worm-business-in-a-box package – and they end up with these visions of creating a massive, super successful business right out of the gates. Sadly, a lot of these very same people are also fairly inexperienced – not all that familiar with all the MANY nuances of worm farming…or even basic vermicomposting. Their enthusiasm gets the best of them, and they end up dropping $1000’s for one of these packages, or for all the worms and supplies to launch a venture on their own. Maybe they even borrow money from a bank or friends and family to make it happen. Well, as you might guess (or even know from personal experience) the chances of success with this type of approach are very low. Some end up completely taken advantage of by hucksters and con artists. Others simply get in WAY over their heads and end up overwhelmed, burnt out and eventually completely derailed. The type of small, bootstrapped business I am proposing in this series is a completely different kettle of fish (can of worms? lol)! Can be started with very little money. Doesn’t need to consume all your time. Doesn’t need a huge amount of space (but if you have it, that’s great too). Allows you to learn as you go. Can start earning revenue very quickly. Is actually FUN!! Not something that leaves you feeling stressed-out and disheartened. And don’t be fooled by its tiny size either! The type of business I’m talking about is one that has LEVERAGE, thanks to the ‘power of the web’. So you CAN scale things up over time. Sound like a pipe dream? If so, I’m not surprised. And I promise this is not a bunch of hype! Also note that the main model discussed relates mainly to selling composting worms. BUT the good news is that a lot of the principles we’ll cover and plenty of strategies can be adapted to whatever type of worm farming business (I use that term loosely) you care to launch (or currently have up and running). I may even spend some time exploring various other approaches in upcoming lessons (we’ll see how things pan out). On that note, that is all for this introduction to bootstrap Worm Farming. I hope you are looking forward to the rest of the series. Please remember to sign up for the e-mail list if you want to stay up to date. Also, don’t hesitate to send me an email or leave your comments below if you have any questions/thoughts you’d like to share. I wanted to register but clicking on the link takes me to a member login portal. Help please. I assume you are talking about the Modern Worm Farming email list link? Clicking that actually takes you to a sign up form for the email list (does look like a login box though). All you do is enter your name and email and submit (then you will receive a confirmation email – you need to click the link in that to be fully signed up). Thank you very much for all your shared efforts and wisdom! I’m looking forward to more in this series.